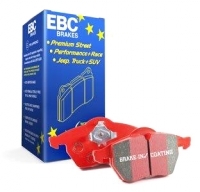 EBC black coated brake pads are a high friction premium quality friction material approved to ECE R90 brake safety regulations and as such are an exact equivalent to original equipment pads fitted to your vehicle from the factory. When you buy EBC R90 replacement pads you are getting an exact equivalent to an original equipment pad for far less money. Don't let the lower price point cloud your view of this superb quality product, these pads will stop your vehicle as fast as any original equipment pad and faster than most aftermarket pads. 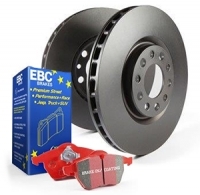 One brilliant feature of EBC R90 pads is their ability to completely eliminate brake judder and these pads will actually COMPENSATE for mild brake judder after 300-400 miles of use. European cars are built with high friction brake pads and must be replaced either with original parts or an aftermarket pad, such as EBC Greenstuff, which has a matching friction level (average friction coefficient 0.55). Failure to do this will result in a brake imbalance front to rear on your vehicle. 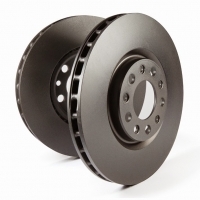 Since this material was introduced in late 2003, it has received many positive write ups from performance drivers of faster cars such as the Impreza. You can read some of these write ups and comparisons to other performance materials on www.scoobynet.co.uk and www.subiegal.com. This is a truly impressive fast road pad for repeated heavy braking. It emits far less dust than semi-metallic pads and has been proven to stop a saloon car 13 metres quicker than OEM pads from 100mph/160kph. 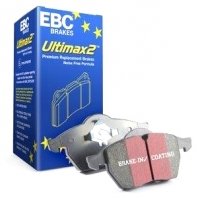 Features EBC Brake-InTM surface coating which conditions rotor surface and accelerates pad bed-in. Although a full race material and capable of high temperature use with very good wear life, this new formulation sets a new trend in race type brake pad compounds. The bite from cold is superb which is uncommon with race materials (normally requiring warm-up) and makes this a pad which can be safely used on the highway as well as on the race track. This new formulation was used by numerous championship race and rally drivers in 2004 and is truly a milestone in brake pad material development. Nominal friction coefficient 0.6 with zero rotor damage and low dust. EBC Bluestuff is the latest track and race heavy duty compound from EBC Brakes designed to bed in fast and proven to provide high friction braking with minimal rotor damage, zero heat fade and a good to excellent life time. Another great feature of Bluestuff is that it has great bite from cold and is a fantastic drive-to-the-track. This is achieved by blending with specially chosen man made naturally mixed fibers which are much less harsh on rotors that are used by all other race pad builders. Lifetime is good enough to be able to bed pads on the way to the track and race for several weekends with only one set of pads. Bluestuff is intended for mid weight and heavier cars - lighter vehicles such as a Miata will be better using Yellowstuff pads. EBC OrangeStuff is the latest Full on track and race heavy duty compound from EBC Brakes designed for track only. An excellent solution for 4x4 use, this heavy duty Greenstuff formulation has slightly lower friction than its 2000 series counterpart (average friction coefficient 0.45mm) but has the benefit of longer life and better resistance to offroad conditions of dust and sand etc. 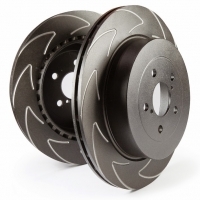 It has an extremely low rotor wear factor and medium-to-good lifetime. For a small price premium over the 6000 series these pads are THE ULTIMATE SUV FRONT END PAD These pads will stop faster and last longer with almost zero brake dust and are EBC's premium offering for heavy 4x4s. These pads are GUARANTEED noise free. Average friction coefficient 0.45mm. The small amount of dust which is evident after thousands of miles of driving with SUV Supreme can be washed away with a simple sponge and water or in any car wash, it does not take aggressive scrubbing or cleaning of the wheels as is common with many semi metallic fibre based pads. 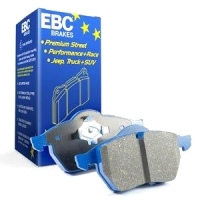 Offering up to 90% dust reduction compared to most original and aftermarket pads, the small amount of powdered dust which does appear is simply washed away during a drive through car wash. EBC SUV Supreme pads do not include any steel fibre or ferrous elements and therefore none of the dust etches or adheres to wheel alloys and gone are the days when SUV Supreme pad users will be spending Sunday mornings scrubbing alloy wheels clean. The Ultimate Truck & SUV Performance Brake Pad. It's new, it's the best, and it's available NOW. A refined version of the famous EBC Yellowstuff race formulation is now available in pad designs to fit popular American trucks/pick-ups. This fast growing market for diesel engined trucks with horsepower increases has thrown up a black hole requiring a performance pad to fit these makes and models that will stop even the fastest driver in a heartbeat. Average friction coefficient 0.6 with similar dust to original pads. Yellowstuff diesel performance range is a high friction aramid fiber pad, very low in its dust characteristics, totally resistant to brake rotor vibration, and easy on rotors. New carbon granule base material, which is extremely rotor friendly, medium dust, low noise and each set is supplied with revolutionary NUCAP piston insert shim. 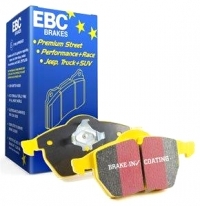 EBC Brakes has used a new ECO friendly technology to develop a brake pad that has higher friction levels, while maintaining great street use with brake effect being strong from cold when the brake is first applied. The race pedigree of the material used also guarantees effective stopping up to temperatures exceeding 1400 F, well above the maximum experienced in heavy braking, towing or downhill descents. New EBC Blade slotted rotors are built using the new EBC High Carbon GG15HC iron for all front fitments (rears are in standard iron) and come with the black Geomet finish for superb looks and corrosion resistance while offering the ultimate in sports rotors. The wider slot actually draws cool air across the pad surface keeping pads and rotors cooler. They also expel dust, dirt and hot gases better than fine slots which eventually fill with rust and scale and become ineffective in our opinion. 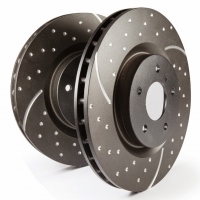 The blind drilled holes break down surface gases when braking from speed but do not weaken the rotor cross section as can happen with through drilling, thereby lessening the chance of rotors cracking over time and heavy use. The new ultimax series offers much quieter braking and features a black Geomet coating to prevent corrosion. EBC Premium Disc - EBC is proud to be one of the only companies selling a British manufactured brake disc. Our high quality grey iron includes copper to increase thermal conductivity and wear properties. 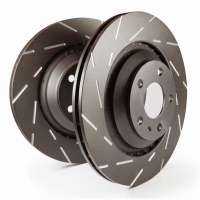 These rotors are come with the black Geomet coating to prevent corrosion. EBC Greenstuff pads have been type approved on every car they are recommended for and can be considered a perfect replacement for original parts on European cars. This is known as an R90 European brake safety test. 100% of EBC’s pad offerings are R90 tested and approved. 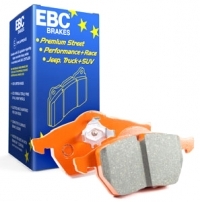 The EBC product even includes wear sensor leads where required. On VW and Audi models the sensors are bonded into the pad and come with your pads. 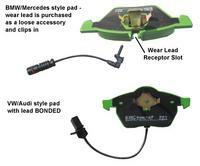 On BMW and Mercedes models the pad has a wear receptor on the top of the back plate and the wear lead clips into this. It is not necessary to replace this wire at every pad change unless the contactor has activated and is worn. EBC Premium Disc - EBC is proud to be one of the only companies selling a British manufactured brake disc. Our high quality grey iron includes copper to increase thermal conductivity and wear properties. The new ultimax series rotor offers much quieter braking and features a new special paint process to prevent corrosion.